I’m about to embark on what may be a touchy subject. With a significant lack of useful Nationals news (outside of one re-signing and a bunch of non-news coming out of Winterfest), what the heck. Lets argue some more about the Hall of Fame! A week ago, in what was of little surprise to those reading the writing on the wall, Jack Morris (and his long-time and deservingDetroit teammate Alan Trammell )were selected to baseball’s Hall of Fame by the “Modern Era Committee,” which exists to make “amends” basically for voters who have shown themselves as a body to do a pretty crummy job of evaluating players from the 1980s. I have written on Morris in the past. See this 2012 post specifically about him and the meaning of Stats versus Fame, and more generally about how badly the 1980s are under-represented in the Hall in this wide-ranging 2013 piece. There are many who think Morris’ selection is an abomination. He now as the highest career ERA of any Hall of Fame pitcher … often noted by the same people who then turn around and tell us that ERA isn’t that great of a measure. He led the 1980s decade in Wins during perhaps the last ERA where pitchers were really expected to “finish” their games on a regular basis (its notable that Morris has 5 times as many complete games as the 1990s decade Wins leader Andy Pettitte, who himself is as controversial of a Hall candidate as Morris) … but then we also know that “Wins” aren’t that great of a stat either, at least not in the current era when starters rarely get out of the 7th inning. Morris isn’t the “worst” pitcher in the Hall by bWAR: sort the register by bWAR and you’ll find that Morris is obviously below the Hall average, but well above several pitchers who you should quibble about more than Morris. He certainly stands ahead of nearly every “closer” currently in the Hall, less of an indictment of Morris and moreso of the game’s obsession with the Save statistic. Head over to Fangraphs and you’ll see that Morris ranks 63rd all time in fWAR, notably ahead of luminary Hall members Whitey Ford and surprisingly Sandy Koufax and miles ahead of the likes of Catfish Hunter or Bob Lemon or Lefty Gomez or Dizzy Dean or all the rest of the relievers. So by both primary WAR measurements, Morris isn’t nearly the worst pitcher enshrined. Yet he was easily the subject of the most vindictive anti-campaign. Why? Why was his candidacy and his career so belittled while a career mediocre stats accumulator like Bert Blyleven so championed? I don’t know. Did we hear this much vitriol when we elected Hunter? Ask yourself: If Koufax had played in the modern era, put up his stats for a few years then retired at 30 … would he be elected to the Hall? I couldn’t agree more. And that, to me, is what the Hall of Fame should be about. It is entirely possible that the whole of the 1980s was just a “down” era for starters; how else can we explain why the leading pitchers of the era got so little recognition? I’m talking about Fernando Valenzuela, Bret Saberhagen, Dave Steib, Orel Hershiser. Maybe even Denny Martinez or even Dwight Gooden. This list includes guys who won more than a quarter of the Cy Young awards from the 1980s, yet none of them even came close to enshrinement … and most of them fell off after one year of eligibility. The Hall of Fame has gone *out of its way* to enshrine early baseball players, so much so that even a die-hard fan doesn’t recognize many of the names. This 538 piece shows the statistical analysis: in the 1920s there were just 16 teams … yet there are 28 players from the era in the Hall, or above 12% of the eligible players. Yet we sit here and make excuses as to why the guy who holds the record for opening day starts and leads the decade in Wins isn’t worthy. I’m happy Morris is in the hall of fame. He inarguably was one of the most “famous” pitchers from his era. And that’s what an establishment with the word “Fame” should be striving for; showcasing those who were known for an era. « So, how much did Shohei Ohtani just cost himself? Subscribe to comments with RSS or TrackBack to 'Jack Morris gets his due'. Who is the Hall of Famer? Those lines are pretty darn close. You’d probably give the nod to A . . . unless you needed him to start in the postseason, because Gio is A and Morris is B. That’s right, they just elected Gio to the Hall of Fame. I’m not losing any sleep over Morris’s election. All I’m saying is that if he’s in, then so are a truckload of the guys still being debated like Mussina, Schilling, and probably Pettitte. The quickly dismissed Kevin Brown was significantly better than Morris. Also, this IS Nat news, because if Morris is in, there’s no way that Max won’t be. I’ll find the stats I posted under the Halliday RIP and move them forward. Don’t sleep on Stras in this list, by the way. I know it’s early for him and Sale, but they stack up with anyone. — Marvin Miller was also on the Modern Era ballot and got passed over again. That’s a total fraud. He did more to shape baseball in the last half-century than anyone else. — Ted Simmons really has a good case among catchers, better than Morris has among pitchers. — If “fame” truly is a consideration, then Dale Murphy and Dave Parker deserve some serious reconsideration. Mattingly and Garvey had the “fame” but not the careers of those two. But if Murphy and Parker are in, then so are McGriff, Guerrero, Walker, Kent, Berkman, etc. I don’t have a problem with that. Some people do. KW: part of my larger point (that modern voters are holding Pitchers to a ridiculous standard) absolutely figures in with consideration of Mussina, Halladay, Schilling, Brown, and a number of others. Its patently ridiculous that Mussina and Schilling are not it frankly. Murphy, Juan Gonzalez both won 2 MVPs and are not in. that’s hard to do. Scherzer, by virtue of his getting a 3rd Cy Young … is basically now a lock. Strasburg vs Sale. Here’s an interesting question for you: Is Chris Sale an “Ace?” Is Stephen Strasburg? I laugh when i see someone claim that Strasburg isn’t an Ace. I’m not sure what else he needs to do to show that he’s one of the best 10-15 starters in this game. Strasburg ranks 10th total fWAR (Sale 3rd), 17th ERA (Sale 11th), 6th in FIP (Sale 5th), 5th in xFIP (Sale 6th), 7th in SIERA (Sale 3rd), 6th in K/9 (Sale 2nd), 11th in Wins (Sale 6th). Sale has had a heck of a run. But so has Strasburg. If he puts in a 2018 like his 2017 … all these numbers will look even better. Jack Morris was never the best pitcher in his **division** never mind the American League in any given year of his career — Stieb, Clemens, Eckersely, Guidry, Blyleven, Gubicza, Saberhagen, and Viola were all head and shoulders above him. And quite frankly, he was rarely the best pitcher on his own team — just 1985-1987. If pitching one legendary game in the WS is all it takes, then let’s put Don Larsen and Howard Ehmke in, too. Slightly off topic, but we have the potential for 3-6 Hall of Famers on this current roster if things break right for them – Max, Stras, Harp, Murph, Turner and Rendon (no, not Gio). Now we just need to win a playoff series. 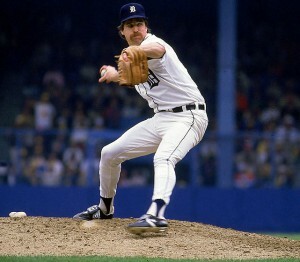 Jack Morris was never the best pitcher in his **division**, never mind the American League. And he only the best pitcher on his own team for three years (1985-1987). Eckersley, Guidry, Blyleven, Clemens, Viola, and Saberhagen were all head and shoulders above Morris. And if having a legendary WS pitching performance is legit, when will Don Larsen and Howard Ehmke be enshrined? Q: Is Stras an ace? Nat HoFers: I’ll start with the easy one — no on Murph. Yes, he’s been of that caliber the last two years, but those were his age 31 and 32 seasons. He’d need a run of five to seven similar years to get into the conversation, and at his age, I don’t see it happening. Murph may end up with a career like Mattingly’s, where he was truly elite for only three to five seasons. Trea: He has a path now that Rock Raines is in, but it’s a narrow one, and it will require him to be good for a long time . . . and to play a lot better than he did in 2017. Raines is in, while Lofton isn’t even really close. Trea is somewhere in their mix. Rendon: There aren’t a lot of 3Bs in the Hall. Also, despite his overall excellence, his career OPS+ is only 116, wRC+ 119. For him to get Hall consideration, I think it’s going to have to be a longevity thing, with 3,000 hits or something. Harper: The “problem” for him is what it’s always been — expectations. I’d say that he’s on a borderline HOF pace. He has one MVP and one 40-HR season. But the burden is high on superstar OFs. He’ll need 500 HRs, four or five 40-HR seasons, two or three MVPs . . . and he’s perfectly capable of all of those. Right now, he’s sort of on a Sheffield/Guerrero pace, guys who are considered borderline as far as the HOF is concerned. Stras: He’s going to be helped when Halladay and his low win total joins Pedro and his. But Halladay has two CYAs, while Stras has finished no higher than third. The next three or four seasons will be key to a Stras Hall candidacy, as he’s at the peak of his career and needs to make the most of it. He also needs a few more signature Game 4 type performances to get the voters over their shutdown bias against him. Max: Since he was older by the time he got really good, he needs a longer healthy regression than Halladay and Pedro had. Pedro’s last good year was age 33; Doc’s was age 34. Max still needs 59 wins to get to 200. Neither Pedro nor Doc got anywhere near that many after age 32. There are plenty of examples of guys who did, though, like Mussina and Brown. In fact, I think it’s held against Brown that he pitched until 40 and ended up with “only” 211 wins. So, here’s a quick benchmark on automatic HoFamers: 3 major awards. If you get 3 MVPs or 3 Cy Youngs, you’re basically automatic (well, unless you’re Barry Bonds/Roger Clemens and have PED stink on you). Can Harper get two more MVPs? Probably. But he needs to stay healthy for a full season and (likely) stay out of the AL where Mike Trout basically is 1st or 2nd every year. Here’s the last few NL MVPs: Stanton (now in AL), Bryant, Harper, Kershaw, McCutchen (probably aged out of MVP discussions now), Posey (entering his age 31 season…he’d be hardpressed as well), Votto (he’ll be 34 next year but just finished 2nd; can he continue to do this?). So, really, Harper is setup well to be a perennial MVP contender if he just stays on an NL contending team and continues to be the dominant offensive force. Much like Bryant, or the leading young hitters on the Dodgers. Rendon faces a much higher bar; he’s going to have to become Adrian Beltre, reach some significant milestones in order to get anywhere close to HoFame. Turner: way, way too early. Strasburg: he’ll need a Cy Young, which is going to be hard because Scherzer profiles as a better starter and they’ll be in the same league for years. Beltre has the 3,000 hits but is also on the verge of 500 HRs, a neighborhood Rendon won’t visit. A more interesting comp for Rendon is Rolen, who will be new to the ballot in January and is getting a good bit of SABR support. Rendon is a pretty similar player to Rolen, with a lot of doubles, good-but-not-great HR numbers, and excellent defense. Rendon needs several seasons like the one he just had for it even to be a conversation, though. Stras vs. Max: I have a hunch that Stras is going to pass Max in 2018, not so much due to Max regression, but more from Stras becoming the monster we always thought he could be. Just a hunch. — Instead of starting a rebuild, the Giants dealt their top prospect . . . for a rapidly aging guy who looks like a lot of the rest of the Giants’ over-the-hill roster. I don’t know that the Rays got much of use in return, but at least they found a sucker for Longoria’s contract. — Speaking of suckers, we have our friendly MASN neighbors to the north, who sat on Britton though the trade deadline and now probably will have to cut him to keep from paying him $12M in his last season. He would then become a very intriguing FA who would probably have to be paid ~$10M for 2018 essentially as a signing bonus, plus the 4/$72M he can probably command beyond 2018. The most likely suitors now, though, are all going to be teams already up against the luxury tax line, including the Nats. I think my general point is that pitchers from the 1980 are underrepresented badly in the Hall … as well as pitchers from the 1990s. Morris wasn’t always the best pitcher in his division sure; Schilling often wasn’t the best pitcher on his own TEAM, sharing rotations with 1st ballot HoFamers like Pedro Martinez and Randy Johnson. He finished runner-up three times in four years for Cy Young; if he had won two of those awards instead, are we having a significantly different conversation about him? I’m also not convinced that these pitchers were all “heads and shoulders” above Morris. Perhaps at peak, sure, but as we all know a HoFame career is about peak and longevity. Blyleven had no peak; his entire case is about longevity. The Bill James article talks exactly about this: Johan Santana great peak, no longevity therefore probably not a Hall of Famer. Of those pitchers you mentioned from the era, only Clemens (an all-time great), Eckersley (who got more than a third of his career fWAR from closing …) and Blyleven (who threw more than 1100 more innings than Morris and thus racked up hundreds more WAR-padding collector stats) had higher career fWARs than Morris. Point is … you can’t have it both ways. If you claim that Blyleven (who got almost zero recognition while he was playing) is some superior awesome pitcher because he played for ever and accumulated all these stats … then you have to credit Morris as well, and admit that his peak was never that of his contemporaries but his longevity gives him some serious credit. Saberhagen is the one that I really wonder about; 2 Cy Youngs, decent career numbers but injury plagued and had no chance at even getting close to 200 wins. Notice how close MOrris and Saberhagen are in career fWAR. The Hall has a real blind spot for guys who had great peaks but not extended careers. Koufax is about the only exception they’ve made. Murphy at his peak of 8-10 years was significantly better than any peak Dawson had, for example. Among the pitchers Todd mentioned, I’d point to Guidry, who was kind of the ’80s version of Johan Santana. Guidry during his nine-year peak was significantly better than guys like Morris or Blyleven ever were. Santana also had an outstanding nine-year run. I don’t really see the others in a similar discussion. Saberhagen had two great seasons, Hershiser just one. I don’t get the interest in Matt Adams over Lind. Lind is a better hitter and hits LHP as well as RHP. Adam Lind: career 56 WRC+ vs lefties (81 WRC+ last year). Matt Adams: career 58 WRC+ vs lefties (46 WRC+ last year). Neither of these guys is on the team to hit against lefties, but a) it’s ridiculous to say that Lind hits lefties as well as righties, and b) it’s also ridiculous to say that Lind hits lefties better than Adams. Lind’s career WRC+ is 111; Adams’s is is exactly the same – 111. These guys are very similar. Lind had a better year last year but not by very much. Adams is five years younger. I think the age difference is probably the most important factor in predicting who will hit better next year, but it’s splitting hairs because they’re so close. At the same price, I probably pick Lind even though I think Adams may hit better because he’s a known quantity and Adams is not (though the new pitching coach surely has intel on what Adams is like in the clubhouse). I think we have to infer that Lind wouldn’t sign the same deal or the Nats had soured on him for some reason. Adams, it is. I’d prefer Lind for similar reasons but Adams fits well too. Remarkably similar players. Now bring back Kendrick, although I’d be ok with a Realmuto/Prado combo (a la KW) if Prado is healthy. I like Kendrick better than a healthy Prado but would swap them if it meant getting Realmuto. There was something weird about the Nats turning down the mutual option on Lind before Lind did. Then they signed Adams for not much less than the $5M they would have owed Lind. I would have preferred Lind but won’t lose sleep over it. The Nats have had terrible, terrible history with bringing back bench guys for a second year and having them fall apart, including Heisey and Drew in 2017. Lind sure was “clutch” in 2017, though. As Derek notes, Adams is significantly younger than Lind, for whatever that’s worth. Here’s my theory on Lind: they figured his 2017 was not repeatable so cut him loose now. At some point in the recent past I listed out all our PH/bench bats who were good one year and then dropped off a cliff (Clint Robinson, Tyler Moore being two good examples). Maybe they’re just getting ahead of the curve. Basically exactly what KW just said. same reason they’re not pursuing Matt Albers; was his 2017 a fluke/one-off or the new norm? I’d bet that it was a fluke; so say “thanks for the great season” and move on. New posted about off-season todo list progress, since that’s what we’re talking about here anyway. One last thing; i’ve been looking for this graph for a while in the context of this conversation. Check out the graph: about 25% of the eligible players from the late 1920s are in the frigging hall of fame. Meanwhile, the 1980s are in the 7-8% range.